Photographic proof that our Tirpitz sits too high in-game. For some time now I have wondered out loud why our Tirpitz sits so much higher than Bismarck in-game. 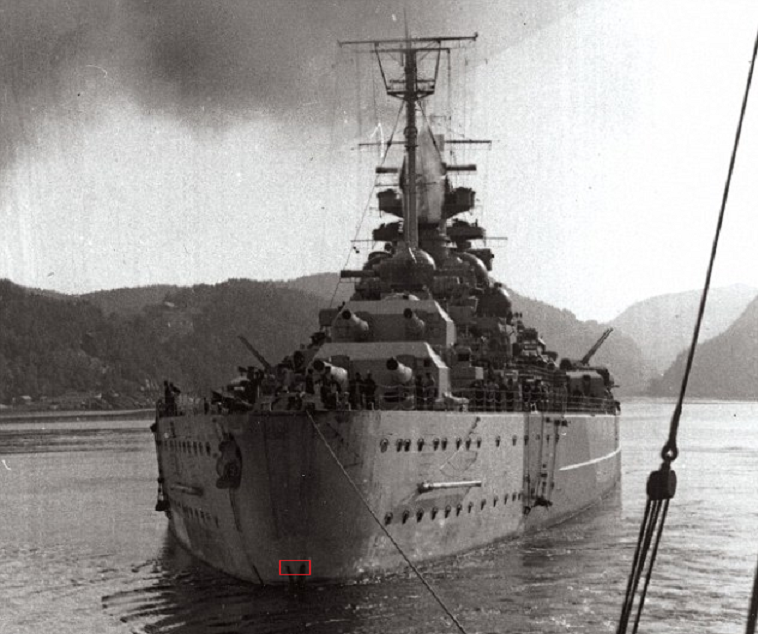 Some have wondered if its a case of Bismarck being too low rather than Tirpitz being too high. In either event, Wargaming has never provided an answer. Perhaps I have not provided enough evidence to support my case? 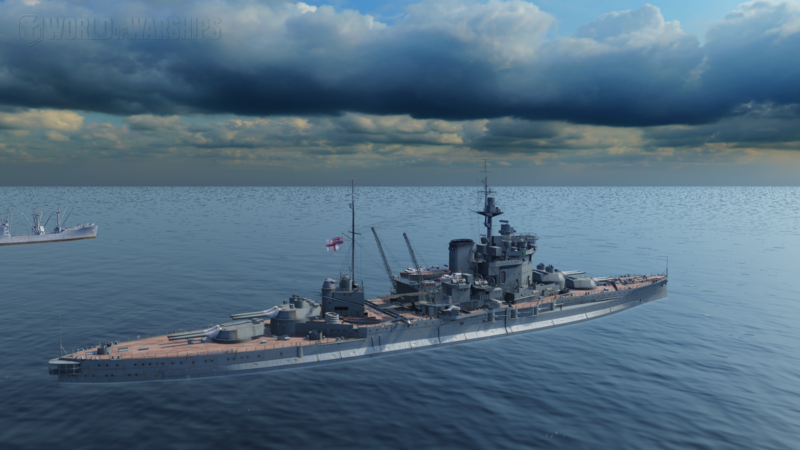 Tirpitz sits too high in-game, and I can PROVE it! Wargaming will have no excuse now! "Dseehafer, how can you tell that Tirpitz sits too high?" You ask? Below is our In-game Tirpitz as seen in GM3D (so the ship isn't bobbing up and down). 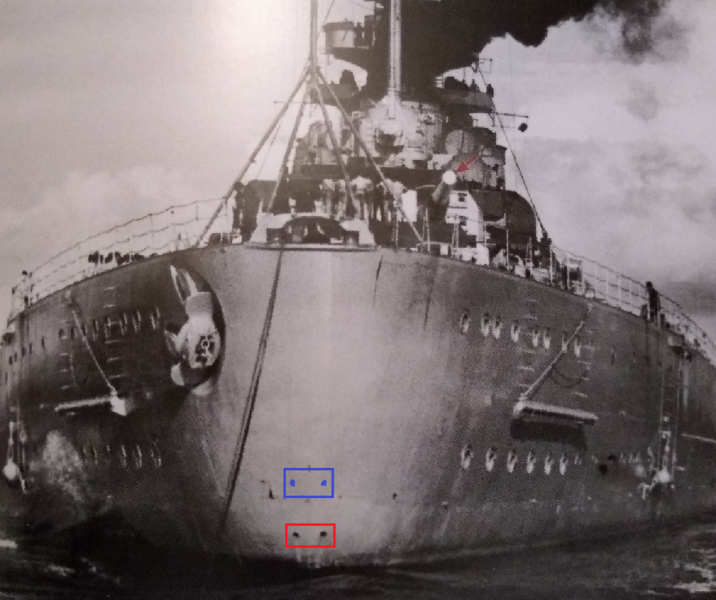 The two dots I have circled are the ship's smoke-generator vents. Comparing the two images they both look to be at about the same height above the waterline. So what's the big deal? Well, first, the historical photograph shows Bismarck, not Tirpitz, and Tirpitz had a deeper drought than Bismarck anyways. Second, and most importantly, this is while Bismarck is fitting out. 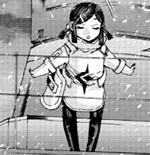 She is nowhere near combat load in this picture and is, therefore, riding quite high in the water. The vents are barely above the waterline! And mind you this was taken during Tirpitz's early trials! This is before she received torpedo tubes, before she received an AA nest on B turret, before she got anywhere near the 53,500t displacement she boasted in late 1943! Our Tirpitz should be AT LEAST this deep, but no, our Tirpitz is sitting so high in the water she might as well be empty with no fuel, food, or ammunition! Premium ships are meant to be historically accurate regarding the ship’s looks in a certain period of time; tech tree ships can be a mishmash of different sisterships and it’s ok.
Yup, looks about... 4 feet too high. Can't deny the second picture from Norway, but isn't the first picture a "stern" picture when you are comparing bows earlier? 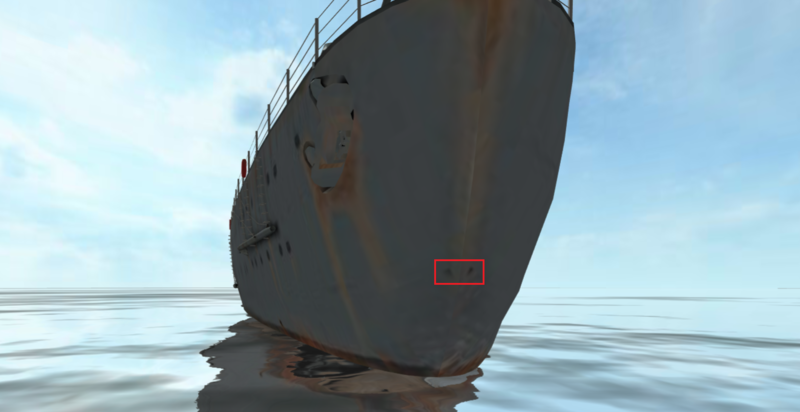 I know nothing, so I have no idea if the smoke vents would be leveled differently bow/stern. Upon closer inspection...I am an idiot. Move along. You should tag some of the devs to get attention. Warspite is fine. I've proven as much using both schematics and late-war photographs. ^ Notice that the little vertical dashes on the torpedo bulge end just above the waterline both in-game and in the 1944 photograph. And then! She sits even lower in the water now! Im not saying you're wrong but it appears the Tirps smoke gen ports are lower on the hull than the Bis. I double checked against that too. The joint in the weld in the hull just below the smoke generators is the same on both ships. On the first historical pic I posted of Tirpitz's stern you can see that this weld/joint is being used as the top of the ship's bootstrap. I just did a quick n dirty check based on the ratio between the row of ports on both hulls vs the smoke port distance below the stern padeye. 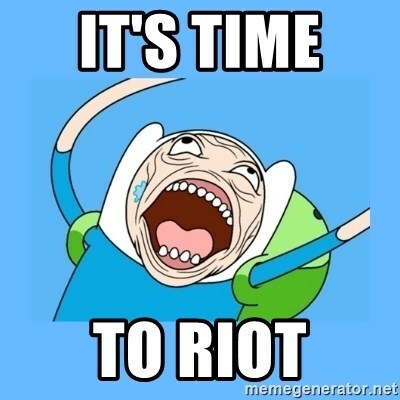 it comes out to 2.2 on the bis and 2.3 on the Tirp. Thats pretty close considering the diff angles and view distance. Interesting photos, but camera lens distortion and perspective do need to be taken into account. Not to rain on your parade @dseehafer you are correct that Tirpitz is too high bur Wargaming has said the will no longer do historical fixes to ships after the Iowa, Missouri and Montana citadel lowering. @LittleWhiteMouse has stated that she was told this by @Sub_Octavian. It wouldn't be a buff. Tirpitz's citadel is just as hard to pen as Bismarck's despite the fact that Tirpitz sits higher in the water. If anything it'd be a nerf to Tirpitz because you're burying your belt armor lower in the water, meaning most shells will pass through the upper 145mm belt (which is where most people aim anyway) instead of having a chance to ricochet against the belt which is more than twice as thick. The ports are in a different spot on the two ships. Look at the weld line, look at the lower port holes. Yes, it is too high in the water, but not as much as the OP is painting it as. Bismarck's ports are roughly where I marked in blue. If that's the case, then it's quite frustrating for certain ships, such as Montana missing 29 mm of deck armor and 19 mm of weather deck (this is backed by multiple primary and secondary sources). Given that there may be more AP bombs coming into the game, this missing deck armor can be the difference between life and death. A slight draft increase probably wouldn't be an overwhelming change for Tirpitz. More concerning though is the fact that the Tirpitz model is off proportionally; she seems to be modeled the same length as Bismarck but in reality she was slightly longer due to her bow stem. That being said, I hope WG would periodically revisit ship models and update them, but fixing Tirpitz's length may not be trivial. 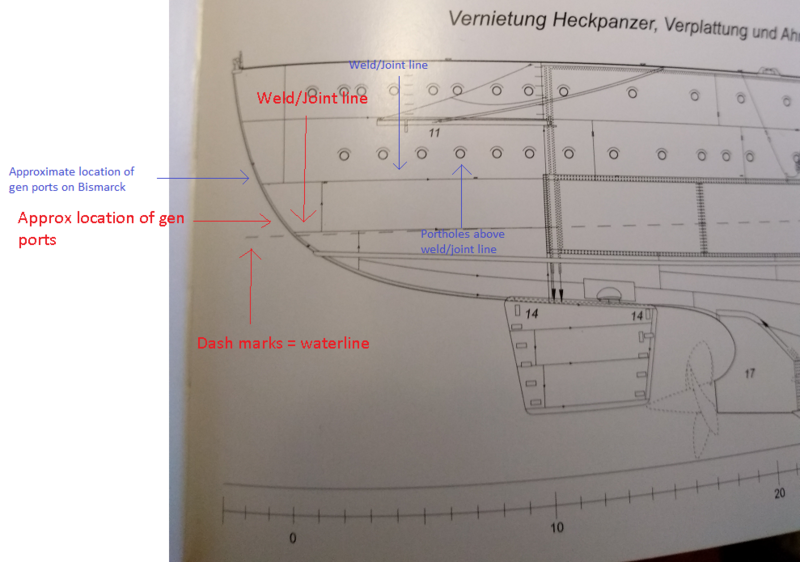 In a similar vein, the Gearing also might be proportionally off (being possibly too beamy) and is also sitting quite high in the water; simply compare her to the Sumner (Yueyang). But the weld line under Bismarck's smoke generators does not connect to the upper edge of the main belt as it does in the schematic. That is what is confusing me. In either event, if what you are saying is true, then WG gave our Tirpitz the Bismarck's smoke generator locations and weld line! So not only is Tirpitz sitting to high (if only slightly less so that was previously thought) but her gen ports are also placed incorrectly!